Hey ghoulfriends! I had planned a whole bunch of fun Halloween looks and then Sir Hunter decided to go through a fun little growth spurt and want cuddles all the time. Naturally, we all know what I've been choosing :) I haven't even had a chance to go get a costume so I think we're just going to put something quick together to go with what Hunter's being. We also haven't had a chance to carve pumpkins! I'm actually shocked we made it out to the pumpkin patch because we've been so busy! Anywho, even if the house doesn't look decorated, I'm still keepin' my fave holiday alive on my nails! 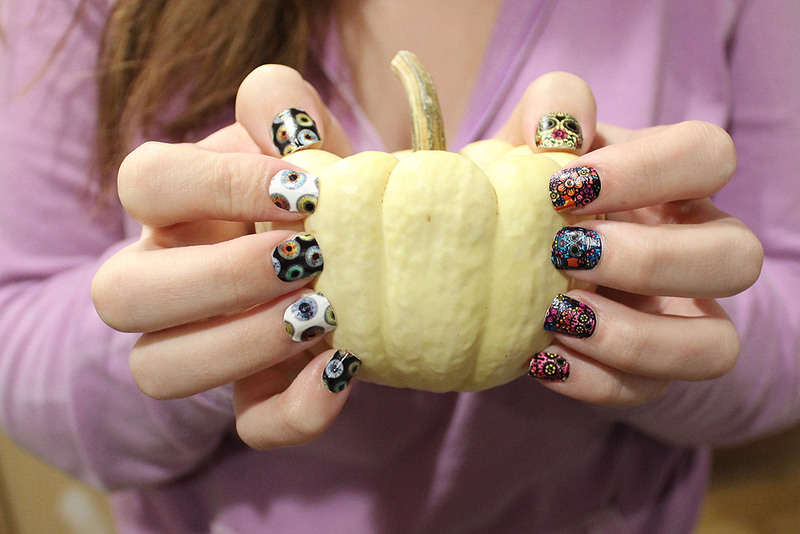 How fun are these Oculus and Calavera nail wraps from NCLA?! Ugh. Too freakin' awesome! Both are killer for Halloween but can also be rocked after the pumpkins are thrown away. 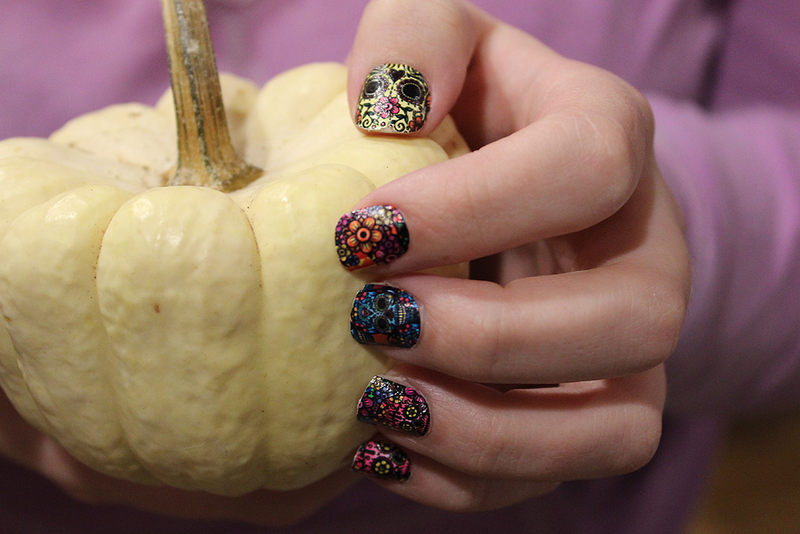 Calavera is a fun colorfully detailed sugar skull print for a fantasy-filled night of glamorous nightmares. No design is like another which I really love. I also like that the print is textured and slightly raised up. So fun! The only issue I had with these is that the whole nail wrap was so cute but the majority of it was cut off to fit my nail. These are definitely perfect for those with longer nails! Oculus is terrifyingly gruesome and eye catching...literally! The print is of different colored eye balls on a black and white background. I love, love, LOVE this print! These are slightly thicker than the other NCLA nail wraps I've used in the past but were still easy to use. Each set comes with 26 adhesives and a cute NCLA nail file. The wrap sizes range from wide to small so they fit just about any nail bed. Start off with fresh, clean nails and than apply a coat of basecoat (I used NCLA Gloss It!) and let it dry. Find the size that best fits your nail and peel from the sheet by the flap. Apply the most round part to your cuticle and stretch down until it fits perfectly. I know some are afraid to stretch it because they think it might break, but I promise you it won't. This is the most crucial part to get a nice, flat, flawless nail. Once you've fit it to your nail, firmly flatten it down starting from the cuticle and pressing your way down to the tip. Use the nail file in a downward motion to remove any excess wrap left over. Apply another coat of Gloss It! and you're all set! I really like using a coat for Gloss It! over it because it softens the nail wrap (as well as adds a shine to it) so you can go in one last time and press down anything you missed or smooth out any mistakes. Anddd a picture from pumpkin picking! I absolutely love this one although Hunter's all like, "K guys. Enough pictures." How cute are his little pumpkin booties!? Your family photo is soooo precious! You are rockin' those wraps, Girl!!! So cute! I love the sugar skulls especially! I love the pumpkin pic! So sweet! What fun nail wraps those are! Beautiful family picture. Love the nails. Great patterns. I like NCLA wraps. Adorable nail wraps and so easy. 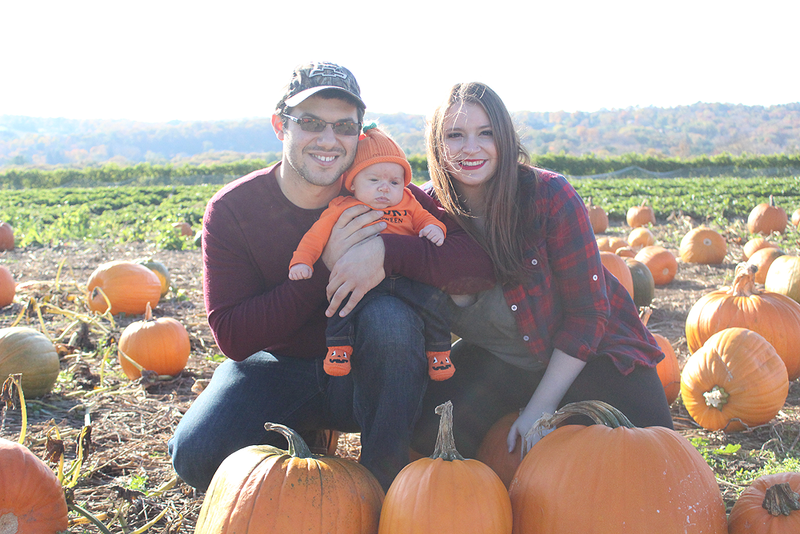 Hunter is so cute - what an adorable family pic! Those nail wraps are stunning! Such a cute family pic!! Those nail wraps are adorable! Gorgeous! Your nails are just gorgeous! Ahhhh the nails!! Soooooo fun!! I love your nails! So pretty. what a gorgeous family photo :) I love your nails, so fun. So, so, so cute! I love everything..and your little family is adorable.